Since for the Roman soldiers and the Greek warriors a section like this exists I set up one for us gladiators as well because I do wonder what you others look like, what types you are fighting in. 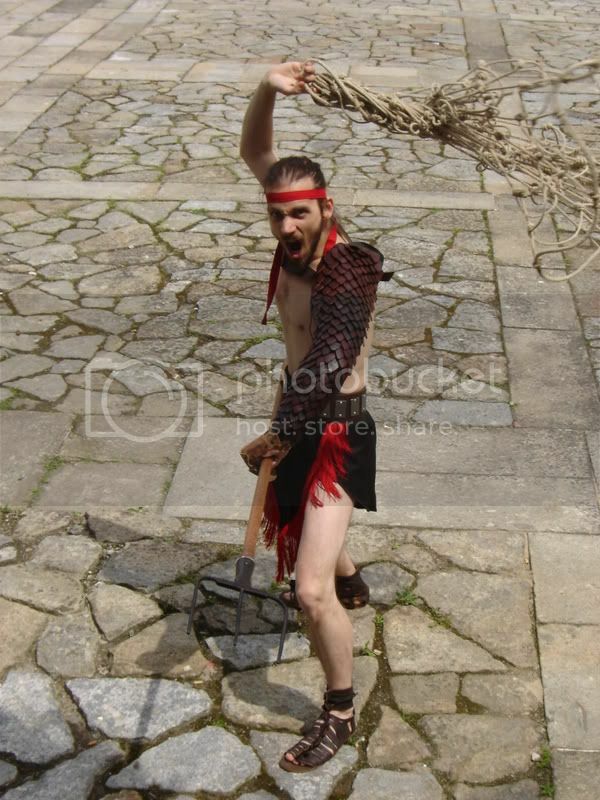 Here is mine as a Retiarius. Picture was taken in Bracara Augusta in Portugal. Or easy to be cut from an overhead swipe if they went the other way. Hard to say, y'know? Same would apply for a "manica segmentata". But generally speaking there would be padding, like the hair-stuffed linen pads below the scale/segments anyway, for the same reasons that padding goes under other armor, right? There are a couple of reasons why i made it that way. One of them is related with net throwing, with the scales the other way around i found that sometimes the net would not get properly "tossed" if it touched my left arm for some reason, it doesnt get stuck or anything but takes out precious momentum, also if my oponent for some reason decides to throw my net against me i simply put my arm out and the net doesnt it me, while with the other hand the trident keeps my oponent and range. Altough you are correct in saying that stabbing would be easier with the scales in that direction it also prevents them from going up, like into my neck (i dont have a galerus....yet). This was my first try at retiarius, and did many things just by testing them, not knowing for sure if it was the proper way or not, sugestions are always welcome. Since I started this post I feel of course obliged to add a picture of me too. I had some taken at the Roman festival in Xanten by Marcel Bieger of the Karfunkel magazine and this is one of them. It'll be a couple of months before I'll be ready to post any pics. Loosing too much weight right now, and none of the impressions are completely ready yet. 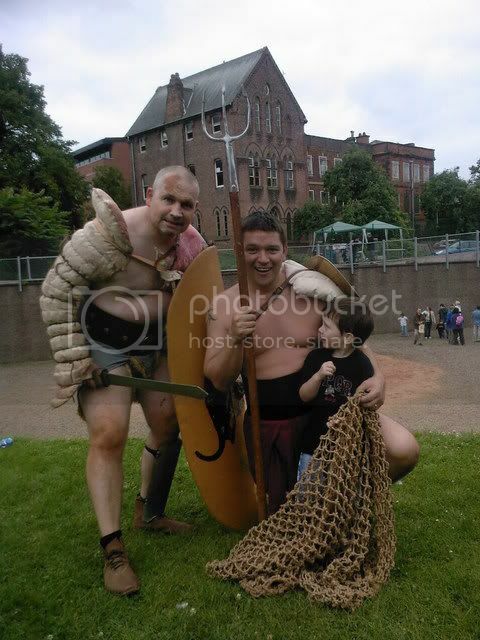 Here's me (Brutus) and my little boy in the Deva Ampitheatre last week. 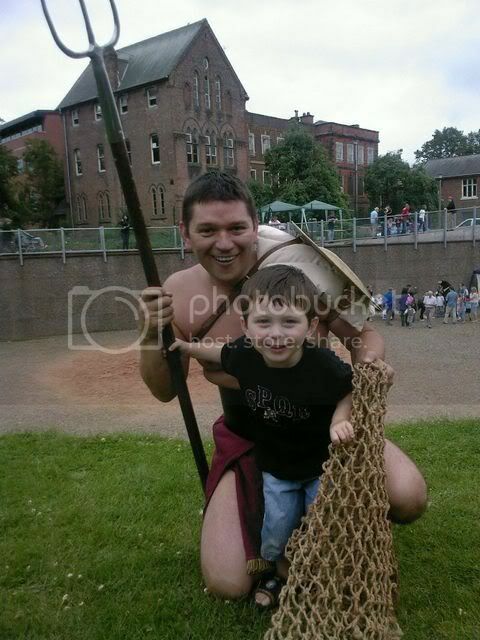 And also me (Brutus) Lupus and my little boy. Where did you get your provocator helmet? Was it made for you? The helmet was custom made by a German smith who's not registered on this forum. He made it after the Pompeii find of the provocator helmet with the lunula repair marks on it. If you want I can give you his details by PN. Please do. Did your helm come complete with the big crack and the lunula? Here are some images of us Georgia Boys at play. Quote: Here are some images of us Georgia Boys at play. Lookin' good Martin! Nice setting, too! That was at the Parthenon (sic) at Nashville, TN. One h**l of a get together.